Last spring, I heard a reading of the opera Steal a Pencil for Me at the Jewish Theological Seminary in New York City. The opera, composed by Dr. Gerald Cohen, with a libretto by Deborah Brevoort, is based on the book and memoirs, Steal a Pencil for Me, by Jack (Jaap) Polak and Ina Soep Polak. I had originally met Jack and Ina in 2004 at another opera, The Diary of Anne Frank, by the Russian composer Grigori Frid. I immediately and unabashedly fell in love with Jack and Ina. Jack was born the same year as my mother, and Ina is 10 years younger. Jack, then 91, and Ina were still playing tennis. Now 100, he seems a bit feeble, although in addressing the audience without a microphone, his voice still has a strong timbre. After my first meeting with Jack and Ina, I immediately purchased and read Steal a Pencil for Me and watched their documentary on PBS. I was totally smitten with their story. Similar to The Diary of Anne Frank, Steal a Pencil for Me begins at a birthday party in German-occupied Amsterdam. Jaap was married and Ina was engaged. Even so, they made a connection. The arrival of the Germans ended the party and Ina’s fiancé was taken away. 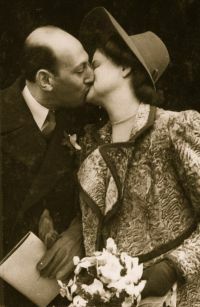 Within a few months, the Germans removed the entire Jewish community to a labor camp, where Jaap and Ina reconnected. In a humorous scene, we experience the German guards and the Jewish prisoners performing cabaret acts together. Jaap’s wife and Ina’s parents learn of their feelings for each other and prevent them from seeing each other alone. Jaap and Ina’s only form of communication become letters. As Ina has begun work in an office, Jaap asks her to “steal a pencil for me” so that he can continue to write to her. The war and the encampment continue. Family and loved ones are lost, Jaap nearly succumbs to typhoid, yet, miraculously Jaap and Ina reunite in Amsterdam, where Jaap gets a divorce and marries Ina. Now, they are at a performance of their opera based on their story. As I am watching and listening to the opera, I am experiencing more than I did when I read the book and saw the documentary. What I am experiencing is the meaning of existentialism. It is not up to the world to provide meaning, but rather it is up to us to provide meaning to the world. And, at the time the opera is taking place, and at the time of Anne Frank, in a different camp, another prisoner, Viktor Frankl was coming to realize that some of his campmates continued to live when they found something to live for. Others, however, would give up the will to live and simply die, no matter how much pleading from their loved ones or prodding from the Germans. When a person loses the will to live, they die. That brought thoughts of my own wife to mind. …Then I grasped the meaning of the greatest secret that human poetry and human thought and belief have to impart: The salvation of man is through love and in love. I understood how a man who has nothing left in this world still may know bliss, be it only for a brief moment, in the contemplation of his beloved. In a position of utter desolation, when man cannot express himself in positive action, when his only achievement may consist in enduring his sufferings in the right way—an honorable way—in such a position man can, through loving contemplation of the image he carries of his beloved, achieve fulfillment. (Frankl 1939, 1963). “I want to know everything about you,” Jaap wrote to Ina. Frankl wrote, “Not only our experiences, but all we have done, whatever great thoughts we may have had, all we have suffered, all this is not lost, though it is past; we have brought it into being.” (p. 131). As Ina complains about the labor camp, Jaap asked her, “Tell me something good,” Ina’s response was simple, but Frankl refers to the power of finding the positive in every situation when he said, “As the inner life of the prisoner tended to become more intense, he experienced the beauty of art and nature as never before.” (p. 62). Jaap dreams of the future with Ina, even a simple dream “When the war is over, I just want us to have a nice breakfast.” Frankl wrote, “the prisoner who had lost faith in the future—his future—was doomed.” (p. 117). There may have been an external force that allowed each to live, but they each survived because they also had an internal force that was the Will to Live. These external forces might include synchronicity—Jaap and Ina end up in the same camp—or intuition, when Frankl chooses not to attempt to escape, and instead, remains to care for his patients. He survived while the escapees were all killed. Or maybe just happenstance, as in the tale of Charlie Dukes. In Good Morning, But The Nightmares Never End, Dukes’ autobiographical story of being an American prisoner of war surviving similar tortures of the concentration camps, he wrote that when he was captured, a German officer pointed a Luger in his face. Before pulling the trigger, he made eye contact with officer, who then told Charlie to get up and join the other prisoners. And, amidst the horrors of the work camps, the death camps, loss of family and loved ones, a simple stolen pencil keeps love, and Jaap and Ina, alive. • I have met the Polaks, read their book, and watched their PBS documentary. But this time is different. Why now does the meaning of Logotherapy and The Will To Live flood me? Was it the addition of the music? Was it seeing actors on the stage, singing and dancing? I am not sure, but I do know that now when I think of the Holocaust, I will not only think of the Allied Soldiers liberating the concentration camps, I will think of the survivors, who against all odds, odds that most of us will never, ever be able to comprehend, had the will to live and some, at 100 years old, still demonstrate that power. Dukes, C. (1997). Good morning, but the nightmares never end. Urbana, IL: Tales Press. Frankl, V. E. (1939, 1963). Man’s search for meaning. New York: Pocket Books. Ohayon, M. (2007). Steal a pencil for me: A film. Produced and Directed by Michele Ohayon. Pollack, J. & Soep, I. (2000). Steal a pencil for me: Love letters from Camp Bergen-Belsen and Westerbork. Bromsgrove, UK: Lions Press.